FILE - Protesters chant during a rally against the travel ban at San Diego International Airport on March 6, 2017, in San Diego. Inside a mosque in the college town of Eugene, a half-dozen men prostrated themselves on a carpet while another man led the midday prayers. Over their melodic recitation came a tapping sound as a locksmith installed higher-grade locks on the front door. Looking ahead, Muslim leaders and others are concerned about anti-Sharia, or Islamic law, marches planned for Saturday in Seattle and about two-dozen other U.S. cities, saying the marches are actually anti-Muslim. They consider the incidents in Portland and Eugene, and other recent anti-Muslim crimes in America, part of an alarming trend that came to the forefront in last year's presidential election with far-right activists portraying Islam — and all Muslims — as a threat. 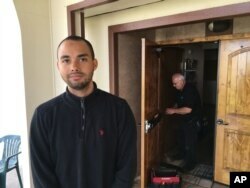 Drew Williams, a member of the Eugene Islamic Center, poses for a portrait outside the building in Eugene, Oregon, as locksmith Jim King upgrades the locks on the front doors, June 1, 2017. "Our Muslim community is feeling a tremendous amount of stress and pressure," said former Seattle Mayor Mike McGinn, who plans to attend a counter-rally on Saturday. "It's important for local leaders to express solidarity and make clear we stand against bigotry, against racism, and with our Muslim neighbors in the state and beyond." ACT for America activists portray Sharia as largely incompatible with American democracy and often warn of a stealth effort to replace U.S. law with Islamic law. Muslims call the claims ludicrous and say Islamic law plays a role similar to Jewish law, as a guide to religious life rooted in the Quran. Aneelah Afzali, who heads a Seattle-area group that works against discrimination and hate crimes, said she will be putting up an "ask a Muslim booth" near Seattle's anti-Sharia rally, "so people can ask questions directly about Islam, and we can counter conspiracy theories, accusations and lies that come from that hate rally." She said she has noticed increased hostility to Muslims, evidenced by the destruction of a granite sign in front of the mosque she attends in Everett, Washington, by someone apparently wielding a sledgehammer. A temporary sign was destroyed a few weeks later. Two far-right groups, the Oath Keepers and the Three Percenters, are to provide security at some of the rallies, apparently the first simultaneous anti-Sharia rallies in the U.S. Members of a third group also confirmed they'll attend, according to the Southern Poverty Law Center, which monitors hate groups. 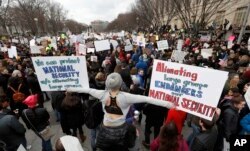 FILE - Protesters carry signs and chant on Pennsylvania Avenue near the White House during a demonstration to denounce President Donald Trump's executive order that bars citizens of seven predominantly Muslim-majority countries from entering the U.S. The marches come amid a rise in reports of anti-Muslim incidents in the U.S., including arson attacks and vandalism at mosques, harassment of women wearing Muslim head-coverings and bullying of Muslim schoolchildren. "Things happen so fast, it's so hard to keep up," said Ibrahim Hooper, communications director for the Council on Islamic-American Relations. Muslim leaders hear echoes of the views of groups like ACT for America in President Donald Trump's temporary ban on entry into the U.S. from six Muslim-majority countries — a measure currently blocked by federal courts — and in his claims of dangers posed by immigrants and Muslim refugees. Trump has said his policies are critical for protecting national security. Mosque member Drew Williams said the man claimed to have killed Muslims while serving in the military in Iraq and told witnesses, "I have no problem killing you."